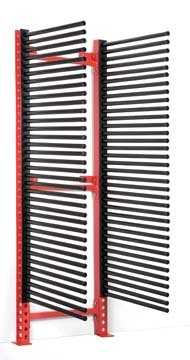 Center of peg to center of peg is 24-1/2"
Purchaser should consult a qualified building engineer and local building codes prior to ordering and installation. Each location should be given careful consideration and review to assure that construction lends to installation and that installation of rack will not compromise integrity of safe occupancy of building. Wall must be load bearing. We make no warranties regarding suitability of individual installations. The wall mount racks can be custom built to your specifications for each individual warehouse requirement.